Casey and her parents are the most disliked family associated with a crime that I have heard of in a long, long time. "She's not doing well at all," Baez said about Casey Anthony. "She wants to know what's going on, and it's not something that she can do right now. I can't imagine a more difficult situation for a mother to be in than the one she's in right now." How can Baez keep straight face, thinking he's actually going to elicit sympathy for Casey! Too bad he doesn't develop a quick case of Tourett's Syndrome and just blurt out to the judge in his next court appearance: " I'm FOS!" Could you have please made your point without making a joke at the expense of people with disabilities? It's not funny. As low as only 5 to 15% of those with Tourette Syndrome have corporalia. Has anyone identified the item in the pic yet!??? My hubby & I have been trying to analyze it & have gone all over the house looking at flex-pipe & hoses. It looks like it is a shower hose & sprayer comparing what we have, but no really sure. Is there a video of this where we could tell more about it?? Something just occurred to me Has anyone done a search under "Household Weapons" to see what comes up? Is it possible they took this because they think she could have used it on Caylee? I called my hubby up to look and that is the first thing he said a hand held shower, on the evidence bag the word porch is written, my guess is to shower the chlorine from your body after you swim. The way they had everything set up in that backyard I'll bet they did have an outdoor shower, they pretty much had every thing else. If that's what it is, why would they take something like that unless they thought it was maybe used as a weapon??!! Going to watch Greta interview where they go thru the house to see if I recognize anything. I think it's just the back yard and bedrooms they show, so if that item in question came from somewhere else, I won't see it. Will let anyone know if I see something that looks like it. Sorry Monkeys I could not see anything that looked like it in the video. The quality wasn't good enough to really see things in the background. Also, the camera moved too quickly and there was that banner across the screen! Listened to some of it, and Greta asked G&C what KC meant about about Caylee being close. This isn't word for word, but CA said "close could mean in the Orlando area, close as in being in the neighborhood close, no I don't think KC meant it like that". She said something close to that!! This was from around early Aug, so it was a little eerie to listen to it now. Tinker and Tillie are cute, poor dogs! They didn't ask to live in that house and they probably know what really happened. If they could talk-I'd bet they would tell the truth!!! The interview is in a few parts though, but there's other interviews and transcripts and stuff! They did take two pesticide tanks from the house. Fairly large ones too. I saw it on NG or CNN. George said Caylee left on 6/16 w/ her backpack. I wonder if they found it. QuietMonkey...thanks for looking at the Greta videos. BooMonkey... thanks for the link for the desk lamp, all the desk lamps I have ever purchased never had such a long bendable cord. So I guess I will change my mind again, it could be a desk lamp. Klass after you animate her snowglobe can you refill my beer??? Thanks for the smiles A1 and Friend. That was a good shake A1! today was a very busy Sunday in Orlando...may allow defense in tomorrow. Yea, I thought that same thing too. That's of course assuming Geo wasn't making that story up. Not sure I believe him about that story. One reason I think it might make sense for this to be a dryer vent brush is that Cindy, in her infinite wisdom washed the clothes that were in the car. LE might want to check the dryer brush for any micro evidence that could have come from the clothes when Cindy put them in the dryer. 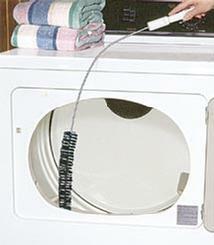 what is a dryer vent brush? i've never seen anything like that associated with a dryer????? You have to order them online, at least ours we did. I have one, or rather used to have one. *Avatar courtesy of CBB, a very talented and sweet monkey. Peaches and 2NJ, may you rest in peace. You will never be forgotten. How have I lived without one of these my entire life? Me either Quietmonkey. I really have doubts especially in light of him saying he was in the trunk of her car at the end of June but that it didn't smell. Dryer lint removal tool. $19.99 at Target. A previous post said that the majority of the "damage" in the house was in KC's room, like the cutting of her mattress, etc. It could very well be her lamp. But does this mean she killed Caylee in her bedroom? What? Kept the dead baby there over night till she left in the morning after everyone left to go to work? Sick. I am beginning to think Caylee was killed in the bedroom, it seems to be pointing that way, or in her bathroom. I will also pray for your dad and you and your family. Is that funny to you? Making fun of people? Always 1, what if the baby you are holding in your lap in your avi had Tourette Syndrome. Will you let people make fun of them? I wouldn't, and I won't. My own baby, who is now 17 years old has Tourettes. Do you want to go "hahahahaha" in his face? We used to let it go past, but no longer. It's time people became more educated. I will forgive your ignorance this time. Did you know most with Tourette's Syndrome NEVER have the problem with cursing? The figure is about 5 to 15% that do. Wehad a bird nest in our vent, i kid you not! Our brush got it. I'm off to bed, night Monkeys! Page created in 6.158 seconds with 19 queries.